This firm beginings can be traced to 1880 when Angel La Madrid Cuesta (1858-1936) and his brother Vicente, Spanish immigrants from Asturias, established a cigar factory in Cuba. Angel came to the US and in 1884 opened a cigar factory in Atlanta, GA. Peregrino Rey (1863-1920), also Spanish immigrant from Galicia who had come to Cuba in 1876 where he became an apprentice cigar maker, moved to Atlanta in 1886 to work for Cuesta. 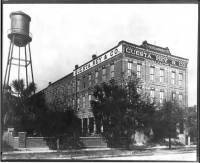 In 1893 Angel L. Cuesta moved his Georgia cigar factory to the Port Tampa area to be closer to the supply of Cuban tobacco and to the flow of skilled cigar workers arriving daily to Tampa, while Peregrino Rey remained in Atlanta. In 1894, he merged his company with the Ballard Cigar Company to form the Cuesta-Ballard Co. and moved to Ybor City. In 1895, Cuesta closed Cuesta-Ballard Co. and Rey joined him in Tampa to form a new cigar business called Cuesta, Rey & Co. located in at 2015 Howard Avenue at the corner with Beach Street. This building was damaged by fire and torn down in 1989. By 1902 Cuesta, rey & Co. already enjoyed a very good reputation in the industry as evidenced by this article in the March 21, 1902 Edition of Tobacco publication . The company continued its prosperous existence in Tampa until 1959 when it was bought by the Standard Cigar Company, predecessor to J. C. Newman Cigar Co. who in the 1980’s, moved the brand to the Dominican Republic where it is produced by Tabacalera A. Fuente. While it was cheaper to import raw tobacco and make all Havana cigars in Tampa for the U.S. market, in 1918 Cuesta, Rey & Co. acquired Cuba's world-famous El Rey Del Mundo brand from Diaz Hnos. Co. and opened a new cigar factory and warehouse in Havana, primarily to supply Europe and South America. In 1914 Spanish King Alfonso XIII named Cuesta, Rey & Co. official cigar purveyor to the Courts of Spain. Cuesta, Rey & Co. factory building pictured below was used as a warehouse until 1975 when it was purchased by Joe Demmi. It was damaged by fire in December 1975 it was eventually demolished in 1986. Since there is no standing factory building constructed by Cuesta, Rey & Co., the picture below is of a sign on the Regensburg building owned by J. C. Newman Cigar Co. owners of the Cuesta Rey brand since 1958 when they bought it from the Tampa firm of Karl and Angel Cuesta. We have dedicated a page to Cuesta, Rey & Co. because of the prominence of their name, the fame of their brands and the importance of their contribution to the history of the cigar industry in Tampa.